‘Recruiting for Jihad’ (original title: ‘Den norske islamisten’) gives an insight into a radical islamic environment the public only have seen parts of before. By following Ubaydullah Hussain, the leader of radical islamic group The Prophet’s Ummah, we are witnessing recruiting, radicalizing and networking in Norway. The documentary was initiated by journalist Adel Khan Farooq who got access to Ubaydullah Hussain and his everyday life. Farooq followed Hussain with a camera for three years. In those years we see a young and rather innocent man change from playing soccer on his free time and collecting clothes for people in Syria to recruiting people from the streets, sympathising with IS and helping young converts prepare for jihad (‘the holy war’) in Syria. At one point in the film, Ubaydullah Hussain is sitting at an Internet café in Oslo. The news about the terrorist attack in Paris is still fresh and the terrorists are still on the run. The reporter asks Hussain what he feels about what has happened. «Right now, I only hope that the men the media calls ‘the perpetrators’ gets out of France and to safety», he answers. 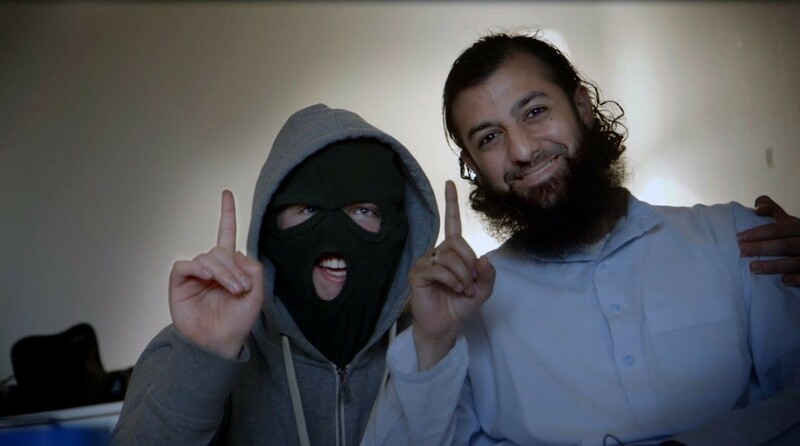 In the documentary we don’t just follow Ubaydullah Hussain on Norwegian ground, but also on trips to London and Copenhagen, where he meets other radical muslim men and gets inspiration for how to recruit more men in Norway. Back in Norway he uses his new learnt recruiting skills and natural fatherly figure to connect with boys not older than 10-12 years old in the streets of Oslo. Besides following Hussain’s life, ’Recruiting for Jihad’ also shows the difficulties of working as a reporter and protecting your sources, when Police Security Service in Norway confiscates some of the clips Farooq and Rolfsen have gathered throughout the process of making the documentary. Farooq and Rolfsen goes to court, arguing for the importance of the freedom of the press and the importance for the press to have access to closed environments like this. A documentary like ‘Recruiting for Jihad’ would not be possible if it wasn’t for the legal right to keep sources and material secret from the authorities. ‘Recruiting for Jihad’ is an incredible piece of investigative journalism in the form of a documentary. In comparison to journalists before them, Farooq and Rolfsen approaches Hussain with the intention to understand him, not to confront him. This gives them access to uncomfortable and sometimes absurd situations; several of the people in the documentary later become executors in IS’s propaganda videos and some even died fighting for IS in Syria. In this hidden network the documentary shows what kind of power and influence the radical muslims can have in Norway, even though Hussain claims the centre of the group contains no more than 30-50 people. As a documentary, ‘Recruiting for Jihad’ is fairly balanced and neutral, and gives a voice to Muslims following Hussain’s way of interpreting Islam. Filmed with a mostly handheld camera, the documentary comes across as real and genuine and will without doubt trigger not only curiosity, but also frustration, anger and maybe even sadness from the viewer. Recruiting for Jihad is directed by Adel Khan Farooq and Ulrik Imtiaz Rolfsen. The production is in collaboration with Curry Film AS and NRK. Adel Khan Farooq is a Norwegian journalist and film maker, who has worked on themes involving Islam, radicalising and alienation. In 2016 he made a debut as an author with the novel «Mine brødre» (my brothers) about a young muslim boy in Oslo. Ulrik Imtiaz Rolfsen is a Norwegian director, producer and writer and is also the founder of the producer company Curry Film AS. He is most known for the action-drama «IZZAT» (2005), the tv-series «TAXI» (2011) and the documentaries «Frivillig Tvang» (2014). Next Next post: What if the world woke up vegan?